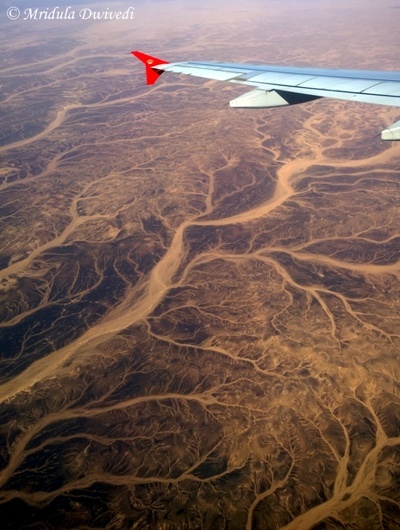 When the plane started making its descent at the Queen Alia International Airport, Amman, Jordan I was hooked to my window seat. If someone could have seen me from the other side, they would find my face quashed flat against the window. The landscape unfolding beneath was unlike any other I had seen ever before! It held me completely in its thrall. I was traveling to Jordan on an invitation from Jordan Tourism Board. This has been my maiden trip to middle east! The Jordan trip is always going to be special for me because I got to photograph Pope Francis on this visit! Most of Jordan is an arid desert but even in my wildest dreams I never imagined that it would look so fascinating from the air! My first stop in the country was also an equally fascinating place, the Dead Sea. Contrary to the name it is actually a lake bordering Jordan, Palestine and Israel. At Dead Sea we were hosted by the Holiday Inn. First things first, the resort has a free wifi access. 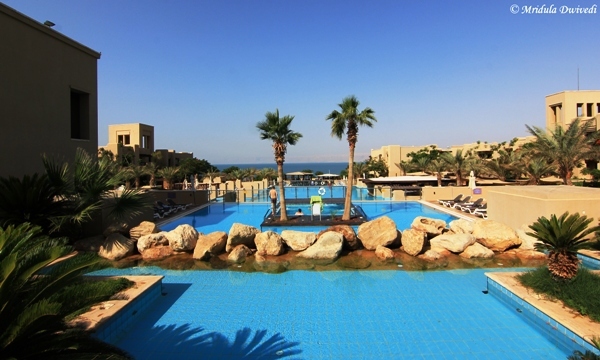 What you see in the picture is the pool area and behind that near the horizon is the Dead Sea. I had a comfortable stay at the resort. Before my visit my niece was quite excited as she was reading about Dead Sea in her school. Dead Sea is 427 meters below sea level. It is one of the most saline lakes in the world. I had infinite fun at the place but that is surely a separate post. 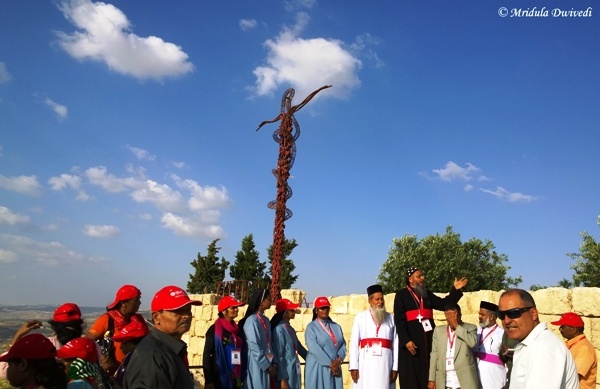 As our primary mandate in Jordan was to cover the Pope’s visit the sightseeing was also around the biblical places. Mount Nebo finds a mention in the bible as the place from where Moses got a glimpse of the holy land though he could never enter it. Our guide Salah told us that on a clear day one could see Jerusalem from Mount Nebo. The group you see in the picture was from a Kerala Church doing a Holy Land tour. Church tours are very popular in the region. 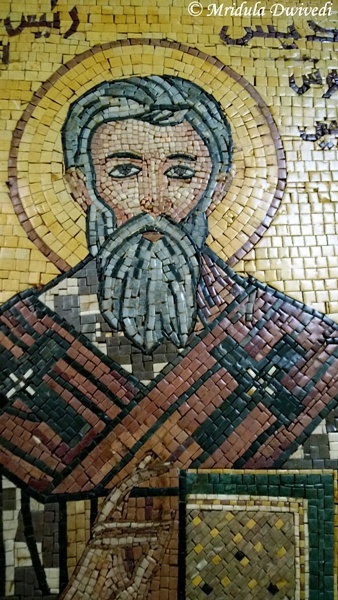 There are outstanding pieces of mosaic art all over in Jordan. The most famous is the mosaic map of the Holy Land at the Greek Orthodox Church of St. George which belongs to 6th century. It was rediscovered in 1896. The mosaics on the church’s walls were equally impressive. Bethany Beyond the Jordan is the ancient site where it is said that John the Baptist baptized Jesus Christ. My mind simply fails to comprehend the significance of the idea! However, its modern day manifestation is an equally fascinating. 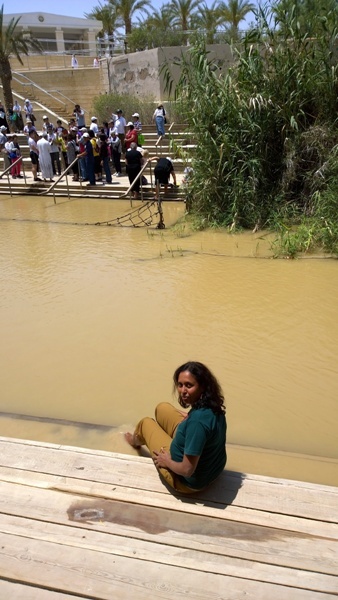 Jordan River flows close to the baptism site and you can see that I am sitting in Jordan. However, across the river is Israel! So if you wish to travel without visa to Israel you simply need to get pushed across! There was a mild visible presence of soldiers on both the sides, so I have warned you too. So, however much I craved for the visa less travel, I firmly remained on the Jordanian side. Being a vegetarian I rarely get excited about food when I travel to other countries. Jordan proved me wrong. They have a culture of serving Mezze or small dishes before the main meal. 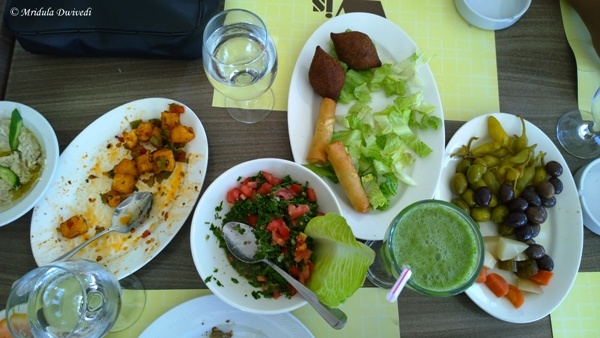 It used to be served with hummus, flat Arabic bread and the salads were lip smacking with many vegetarian choices. They would always find something vegetarian for me for the main course as well, but I could happily live on the salads for the entire trip. Food was certainly a wonderful surprise for me on this trip. 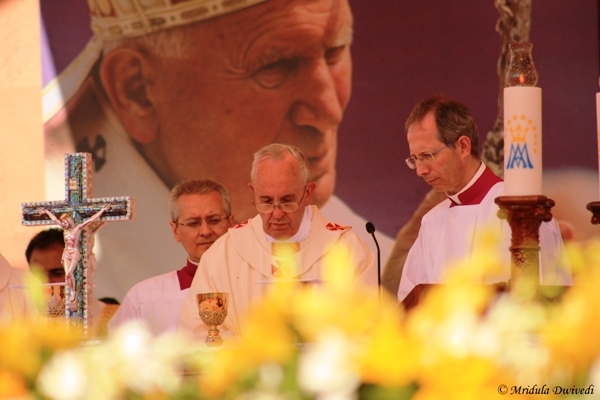 Then came one of the most memorable events of my life, when I attended the Pope’s mass at Amman Stadium and got to photograph Pope Francis! Never even in my dreams I thought I would such an opportunity and that too because 9 years ago I decided to start a blog! 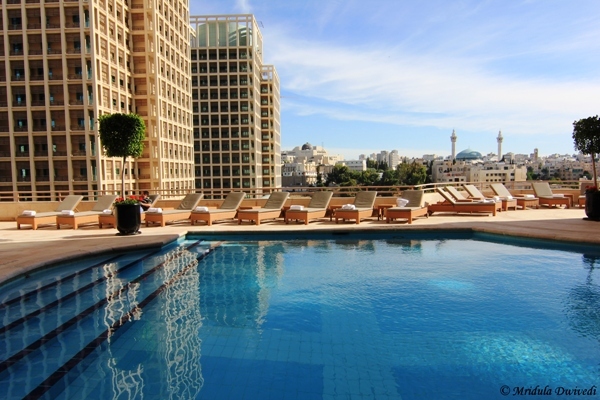 We were hosted at Grand Hyatt in Amman, which was once again a luxurious property. The wifi is not free in the rooms at Hyatt but Jordan Tourism Board had arranged free access for us which was much appreciated. The breakfast buffet at the hotel was lavish. Wifi is free in the lobby. 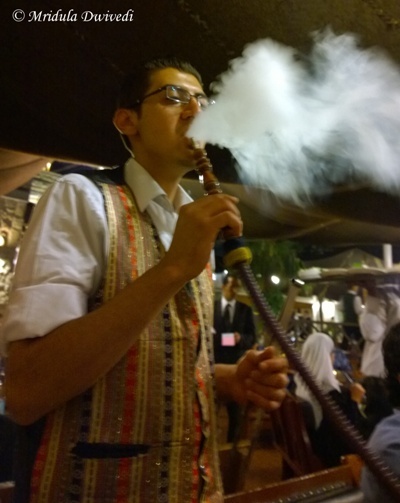 Sheesha is very popular at restaurants in Jordan both with women and men. For the first time in my life I took a few mild puffs and quickly decided it was not for me. Even those timid whiffs gave a sore throat for the next half an hour! 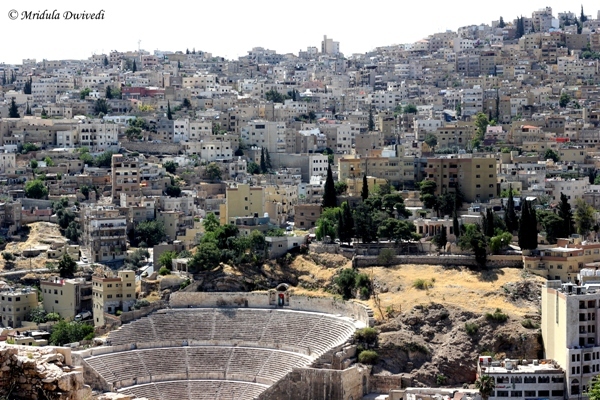 Our last day was devoted to exploring the city of Amman. It has a huge refugee population and the dense housing you see in the picture are Palestinian settlements. I feel I have not even scratched the surface of this amazing country but for me it will always remain special because of the opportunity to photograph the pope. I watched an incredible tv series on Jordan where the host goes around with the king himself to the various places in jordan..in fact the king and his family members also indulge in some adventure sports. I was hooked to this country from that show…your post just increases my apetite to travel there!!! Do go Sushmita you would like it. 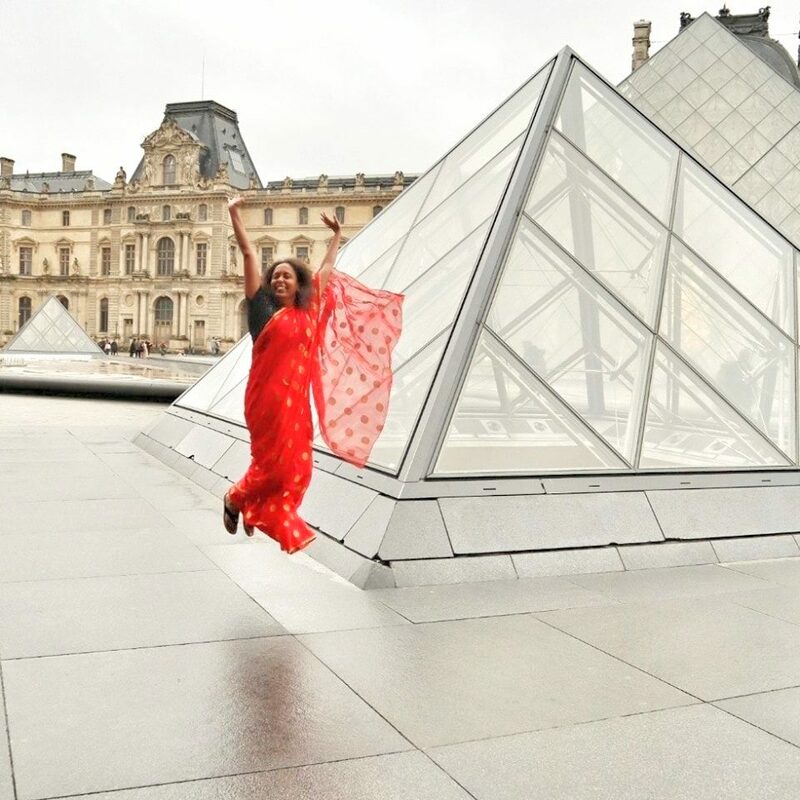 What a wonderful experience that must have been,mridula! Have been following ur fb posts tho I haven’t been able to read urblog,but looking forward to reading a lot more about this trip! What a wonderful experience! Perhaps I ought to get in touch with some Tourist Boards and travel! Great photos and wonderful experience..I liked the first one most.. Thank you Maniparna, it is my favorite too. Ha ha Puru about time you headed that way. Very nice photo and great narration. I heard that no one can sink in Dead Sea because of its salinity. Is it true? Abhijit it would be very difficult as the water has a tendency to throw you up. But not sure what would happen if one panicked and choked or something. It is for sure difficult to drown in Dead Sea. Wow Jordan! You are so so lucky!I am so envious! The pictures are so lovely. I have a friend in Jordan, he always says come come. now seeing your lovely post I will indeed go. Do go Nima, and with a local friend you would explore it like a local! Quite a detailed post there Mridula. Do update your blog url on blogger. It is still the id of your blogspot blog from where you have migrated to this site. A wonderful post as usual! the aerial view of amman airport and mosaic portrait .. fascinating photography .. and congrtss for such an amazing travel offer straight frm Jordan Tourism . Thank you so much Bhavana, it was an amazing trip. Lovely post. You seem to have had a great time in Jordan. Nice photos and useful info.